It's certainly pocket sized - but will it sell? 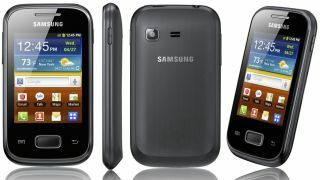 According to a listing on a mobile retailer's website, the Samsung Galaxy Pocket will arrive in the UK this September. As if Samsung didn't already have enough low-to-mid-end devices like the Galaxy Y, Tocco Lite 2 and Galaxy Ace 2, the Galaxy Pocket is also looking to slide in at the bottom end of the smartphone scale. UK network Three has posted a coming soon page on its website for the Samsung Galaxy Pocket, with a tentative arrival date of September. Take one look at the Galaxy Pocket spec sheet and you'll realise that this phone is going to sport a low price tag, offering up the now prehistoric Android 2.3 Gingerbread OS, running on a 832MHz processor and featuring a 2.38-inch display, 2MP camera and 3GB of internal storage. Launch dates are, however always subject to change and we've seen them pushed back in the past, so there's no guarantee that we will see the low-powered and probably low-priced handset in September. We contacted Three, but it was unable to provide us with any more information on the arrival date or prospective prices for the Samsung Galaxy Pocket.